They are clean now, but you know that these socks will spend half their lives in a wad on the floor anyway. 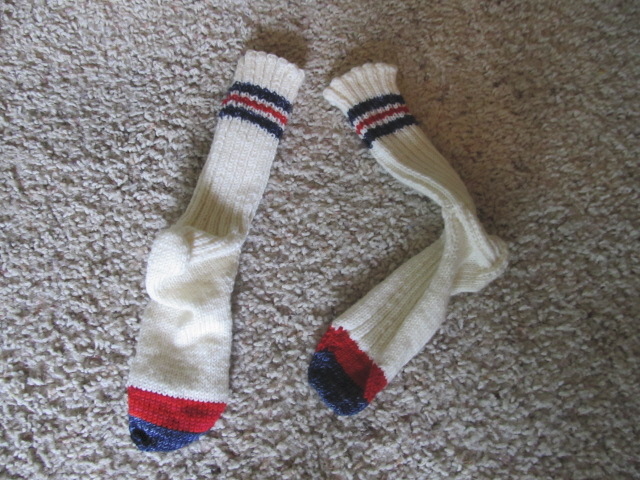 I mentioned a while ago that the Boy had asked for white hand-knit socks. I couldn’t resist asking him if he minded adding some stripes. My brothers used to wear these striped athletic socks when we were kids. My mom usually tried to color code, one brother got red stripes and the other got blue. The Boy requested red and blue stripes, so he can channel 2 uncles. If you are interested in learning to make socks, I have to recommend ” Socks Soar on Two Circular Needles” by Cat Bhordi.http://www.amazon.com/Socks-Soar-Two-Circular-Needles/dp/0970886950/ref=pd_sim_b_3 It is a super helpful explanation of how to construct socks. It isn’t a beginning knitting book, but if you know how to make scarves and hats, and are ready for the next step, this is a great place to start. I consider her basic ribbed sock to be the perfect sock- the ribbing helps it fit perfectly around the instep and stay up on the ankle. It is also easy to memorize, so you don’t need to bring an instruction book with you everywhere you go. That sounds weird- I consider socks to be the ultimate portable project, and I knit riding in the car, waiting for food in a restaurant, or in the waiting room at the eye doctor. Maybe I’m a little obsessed. Many athletic socks are just tubes, but I chose to put a turned heel on these, because they are more comfortable that way. The ribbing makes them very elastic, so they are a good fit now, as he grows they will stretch around. I made the toe a different color so I can take it off and knit a longer foot at some point in the future. Boys grow. Girls do, too, you know. I haven’t adjusted a sock yet, but it is much easier to knit an inch of length onto a sock than to make a whole new one. Time invested in these things is an important consideration. My day job has started back up again, and I’ve been running around back and forth to my school functions, and kid school functions, and the blogging has gone to the back burner. It isn’t for lack of ideas, just time. And camera batteries… Look for tomato posts, and jam posts, and posts about the theory and practice of getting rid of foundation plantings, coming to a device near you! I’ve missed your posts! Glad to have a new one. Back to school has been rough! But I’m glad to be missed, I guess. Dang, you impress me!!! These are awesome!! and they look very comfortable…I love that your brothers wore socks of a particular stripe color…with two boys who will be the same relative size soon enough, Its a GREAT tip! Felecia, it wasn’t just socks, Tim was pretty much all blue, Tom was pretty much all red. Coats, hats, tee shirts. It worked pretty well, I guess.